A stunning strike by Paul Parry secured town their first win of the campaign and extended their unbeaten home record to 33 games! Going into this game not many people expected a home win and to be fair we were living in hope that our unbeaten home record wouldn’t be ruined in the return of a new season. But those of you who were anxious needn’t have worried when Paul Parry smashed a shot into the top corner to get town off and running. @shrewsweb: GOAL! 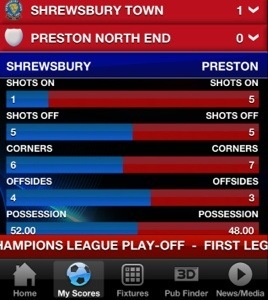 Town 1-0 PNE. Parry, 4. Paul unleashes an absolute thunderbolt from all of 20 yards after only four minutes! The rest of the first half was end to end with really interesting football being played but both sides couldn’t find the next goal. Half time arrived and the fans got to experience the cues and the delights of Jennies catering before taking their seats 5 minutes into the second half after enjoying a chicken balti pie and a pint. Second half started how it finished. Some brilliant football being played but Preston had no luck down either wings with Purdie and Grandison being in top form. It wasn’t long until town came close to a second after Purdie headed just wide after a great corner from Wright. Apart from that, the second half was end to end and very entertaining. And just over 5000 town fans went home happy yet again. Well what a night. Great atmosphere with Turner even commenting on how loud we were. Some decent new songs being trialled as well and hopefully in a few weeks they will be heard all around the fortress. @ConnorQuentin: Great match, Great goal and Great atmosphere. Well played Shrewsbury. SALOP! We want to know who your man of the match is. Voting closes Thursday 23rd August at 8pm. We will then announce who got man of the match and hopefully at the end of the season we can give a trophy to the player who had the most votes. So with town due to play Preston in the league for the first time since 1997, Alex has been given the task of finding out the head-to-head between the 2 teams. So looking back at the history of this tie, it seems Preston have been a lot more successful playing against us and the last time Salop managed to beat Preston was in the Worthington Cup in 2000. Unfortunately this was a 2 leg tie and we lost 5-2 on aggregate. 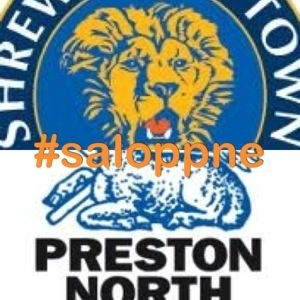 In the league the last time Salop beat Preston dates back to 1994 where we beat them 1-0 in front of just over 5000 fans at the Gay Meadow. Who Scored the winning goal? The first time we played Preston was in 1970 when we lost 1-0 in the old division 3. Biggest Loss v Preston – 1-6 on the 28th August 1993. Interesting that Preston was our last League One home game back in 1997. Can vividly remember their fans banter on where they were going and on our downwards direction. Looking forward to it. So with all this in mind, and the players Preston have brought in, it’s hard to see where a win will come from but we have every confidence.